Imagine a game that draws inspiration from the large scale, multiplayer experience of a title such as Battlefield 3, and combines it with the cops and robbers style of Grant Theft Auto and HEAT. Welcome to POLICE WARFARE; a multiplayer first person shooter set in the world of armed robbery and law enforcement. 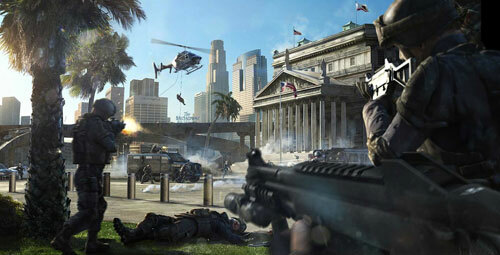 Players will go toe-to-toe as either a member of the Los Angeles Police SWAT team, or the opposite side of the law, robbing banks as an armed gunman. They had me at HEAT (my all time favorite movie). At the time of writing this they are very far away from their funding goal ($15664/325000), but there is a month left so who knows what could happen if enough people spread the word. I was actually surprised that the other crowd sourced video game I blogged about was 110% funded when it ended! Lots more details over at the KickStarter website. Make sure you check it out and even put some of your own money in to back the project if you’re interested. Thoughts? Are you guys excited about these crowdsourced games, or are you happy with what the major game companies are currently delivering? I’m a little skeptic to this approach in gamemaking, honestly. It doesn’t matter how good the team producing it is, or whatever their goals really are, but it all seems to come down to how they’re selling it. That trailer is pretty awesome, yeah, but it only shows their ambitions and defines their target group, but does squat nothing showing what they’ve accomplished so far except for some pretty damn smooth animations and concept models, and proving that they have a pretty decent video editor too. I want specifics; will it be made on a new engine or an existing one (effectively reducing their budget by a shitload), will it use any kind of physics simulation, will there be customization, etc, etc. I’m probably just nitpicking though, hahah. Good points. I think the one advantage is the small amount of overhead these guys have if it’s currently a “spare time” type thing for them. Like you mentioned if they are not using an existing engine (and no doubt paying huge licencing fees) then what are they doing? It’s a bit both ways for me, to be honest; I’m all for the idea of developers producing games for the gamers that know what they want, but on the other hand things like these have no formal guarantee of making it. What if they make an awesome game in the end, but miss out on the budget and can’t afford proper servers to host the game? People wouldn’t get what they “paid” for or funded, and in case the pledge made it they won’t get it back either. Complicated. I’m not sure it will make it. I don’t see a lot of people outside of US supporting a SWAT sim. Pretty ambitious to combine all of those elements. There’s already game that’s been out for a while now called Payday The Heist, that has taken inspiration from Heat. It can be pretty intense, just make sure you play with some friends as it was designed to be a cooperative experience. PC and PS3 I think are the platforms. i don’t think i want to play a game where i have to shoot family pets. dangit! Dave beat me to the pets comment. I like the concept but you know if it gets released its probably going to catch some serious flack for letting people play as bank robbers and shoot cops ala the taliban controversy that Medal of Honor had. just do the gta police mod. I looks cool but i am not smart enough to have tried it myself. I didn’t watch the whole video, and I’m not a big gamer. Way back when (OS Win98) I had MechWarrior and Battletech. Both versions’ 1. I can’t remember which, but on one of the games I was killed almost immediately. I could never play the rest of it, because nothing I could find would let me create a new profile, or try again. The other I played through to the end. I want to say Battletech was the bad game. That turned me off to a lot of the FPS market. And that was what I prefer. would be 100000% dope if they kept as much of the LA county layout.. like.. sunset, and la brea, and stuff… I dunno… I’m down… I love the BF franchise.